Pwo mask. 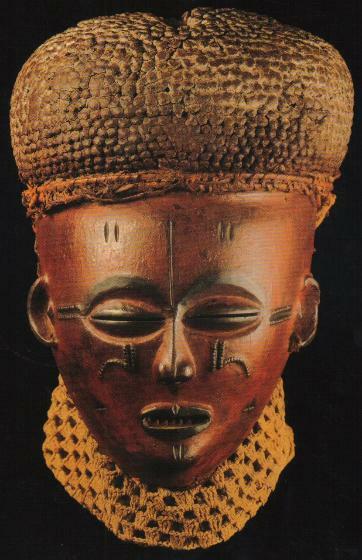 Chokwe, early 20th century. Wood, clay, fibers, pigment; 20cm (7.9"). Birmingham Museum of Art, Museum purchase, 1998.6. 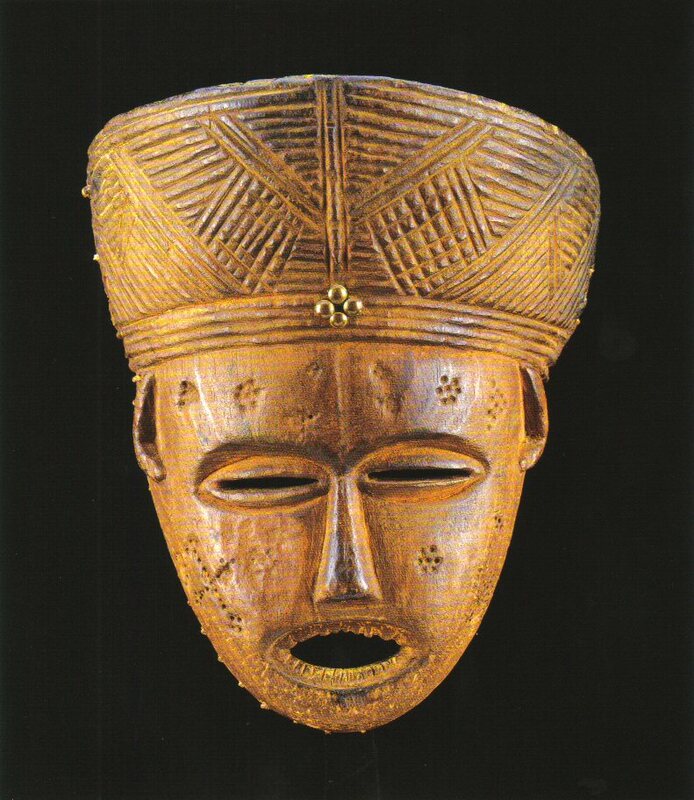 Pwo masks, made by Chokwe and related peoples, are a well-known but understudied genre of African art. Chikufwinda tuhu mwosi nchawa. "It is smoking but there is no firewood." appearances, for in reality there may be little substance behind them." traversed the lands of these central African peoples more than one hundred years ago. 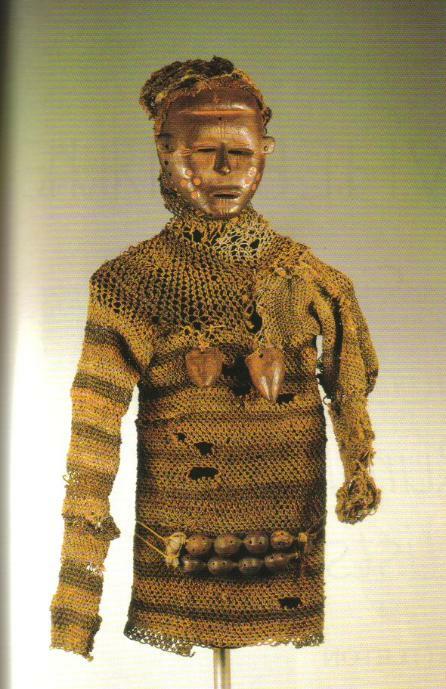 familiar face in most museum and private collections (Fig. 1). Pwo mask. Chokwe, early 20th century. Wood, fibers, metal, shell, pigment; 25.4cm (10"). The University of Iowa Museum of Art, Stanley Collection, 1986.545.
mask. 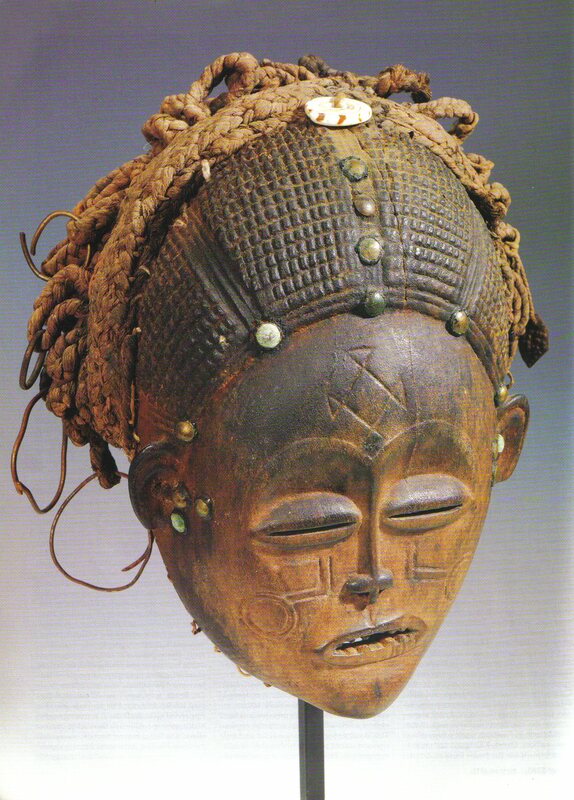 The metal tacks and shell are meant to beautify and honor the female ancestor represented. pigment, fur, snakeskin, and other materials; 21cm (8.3"). Collection of Mr. Helmut F. Stern. 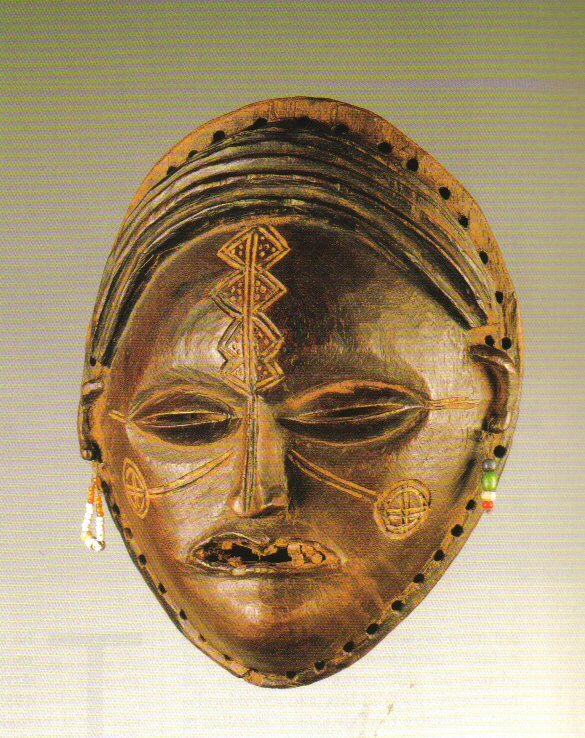 found in rock engravings and paintings in Angolan archaeological sites. that are relevant to this contemplation of Pwo masks. the mouth, nose, and ears, and, in most cases, in facial scarification details. 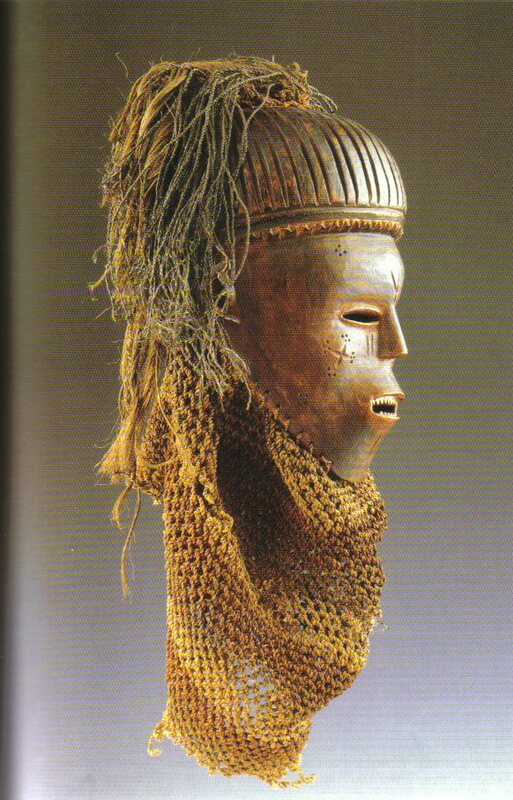 Thirty Pwo masks on display at the Museu do Dundo. From Fontinha 1997:29, fig. 49. Dundo is a town in northeastern Angola near the Democratic Republic of the Congo. 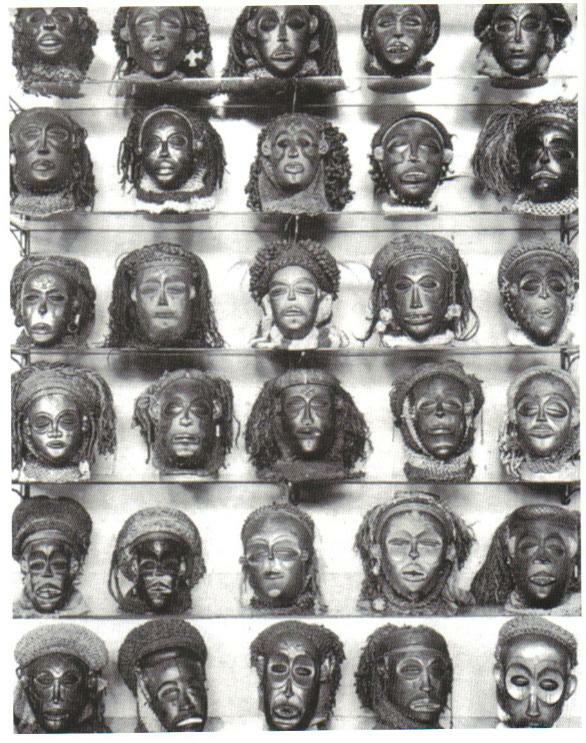 (1965:36-37), who collected most of the Museu do Dundo's pieces (Fig. 4). Pwo mask. Lwena or Luvale, early 20th century. Wood, fiber, pigment; 20.3cm (8"). areas of western and northwestern Zambia, where the Lwena are known as Luvale. a couple of Pwo examples in the museum accurately fit the Lwena style description (Bastin 1961: figs. 261, 262). Minneapolis Institute of Arts, The John R. Van Derlip Fund, 89.15.
or by the family hosting an initiation camp. Pwevo/Pwo mask. Luvale or Luchazi, mid-20th century. Wood, fibers, pigment; 20.3cm (8"). 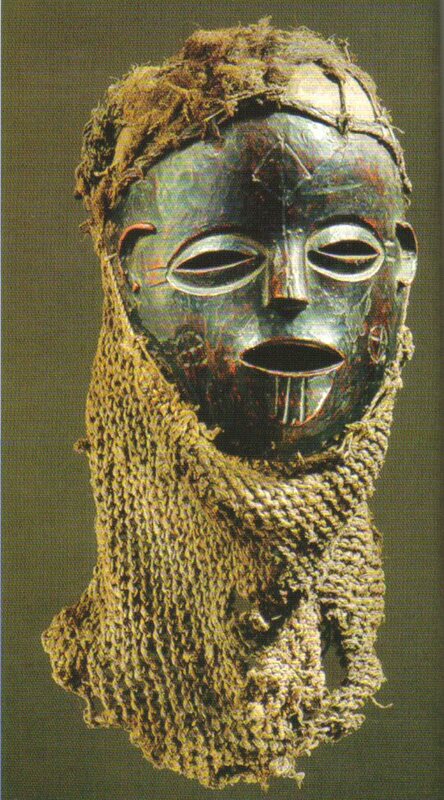 In Zambia, where this mask was probably collected, the Luvale and Luchazi name for Pwo is Pwevo. almost impossible to make a distinction. Pwo mask. Lwena, early 20th century. Wood, feathers, fiber, metal, leather, pigment; 31.1cm (12.3"). 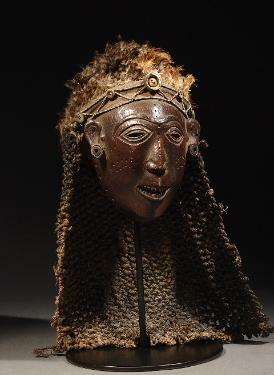 elaborate coiffure, feathered headdress, and overall elegance were key to this interpretation. 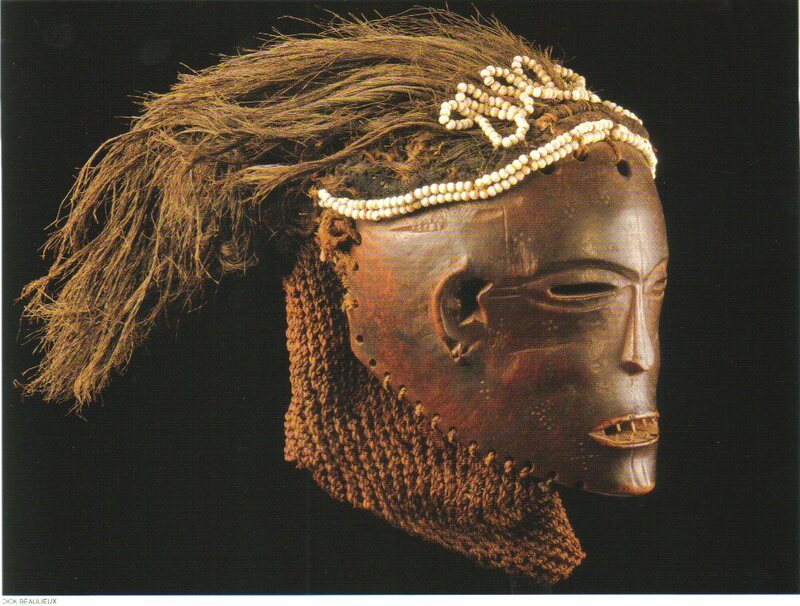 problem compounded by the lack of documentation for these and many other collected masks. examples documented in eastern Angola and western and northwestern Zambia (Fig. 9; see also Jordan et al. 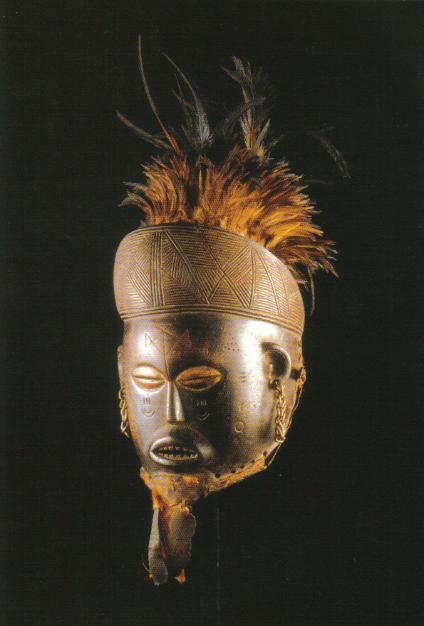 museum and attributed to the Chokwe. south and east of the town of Mexico in Angola and in areas of western and northwestern Zambia. Pwevo/Pwo mask. Luchazi, early 20th century. Wood, fibers, pigment; 20.3cm (8"). Molly and Walter Bareiss Family Collection. boundaries, and similar Pwo styles are commonly found on both sides of the political borders of this region. of the southern Lunda, Mbunda, Mbwela, and Ngangela (Fig. 10; Felix & Jordan 1998; Kubik 1993:25, 98-99). Pwevo/Pwo mask. Luchazi, mid-20th century. Wood, fibers, beads, pigment; 17cm (6.8"). photographed in the field in 1971 (Kubik 1993), it wore a different coiffure and beaded hair decorations. without concrete field documentation such an exercise would remain highly speculative. masks were available to performers who wore them in dances held in the context of a Dundo "cultural village,"
where Portuguese and other European visitors constituted the main audience (see Areia 1995; Porto 1999). Museu do Dundo was a supermarket of regional art forms divorced from most of their original cultural framework. and red cloth or paper. 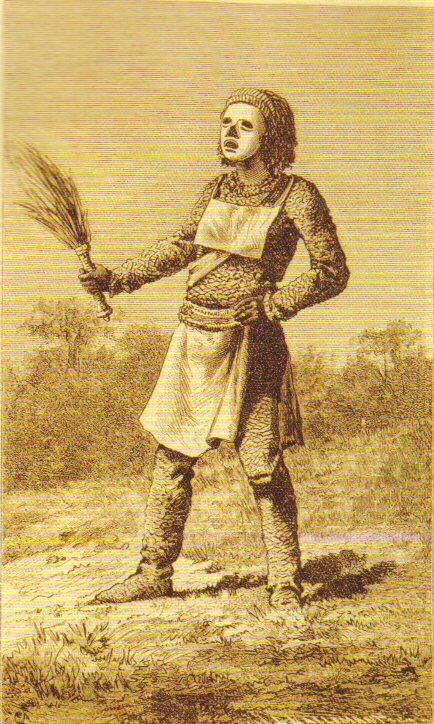 the context for akishi masquerades and their attributed meaning or meanings. status, and this particularly refers to the mwana-pwevo. and comparable models for a "fulfilled" versus a "potential" woman (Cameron 1998a, 1998b; Jordan 1998). Luvale Paramount Chief Ndungu. 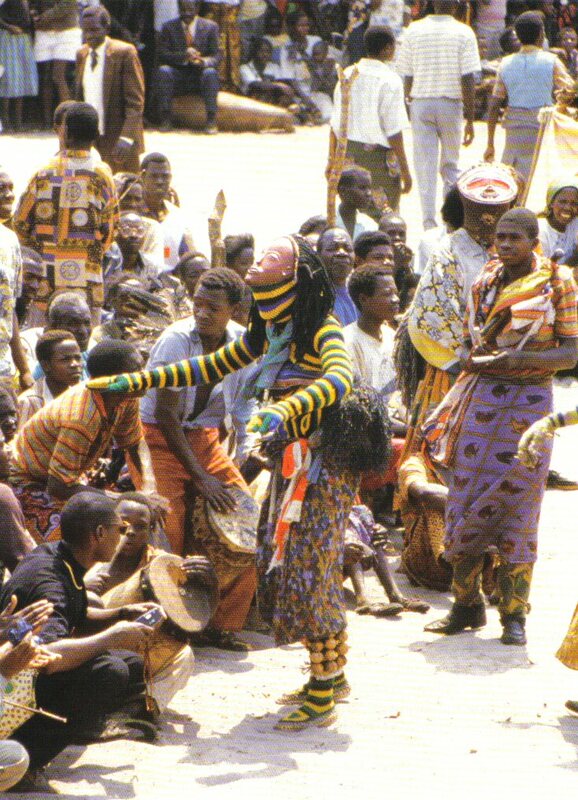 Zambia, 1997. Photo Manuel Jordan. comparable social and moral values. Pwo/Pwevo mask with partial costume, mid-20th century. Luchazi or Luvale. Wood, fibers, pigment. 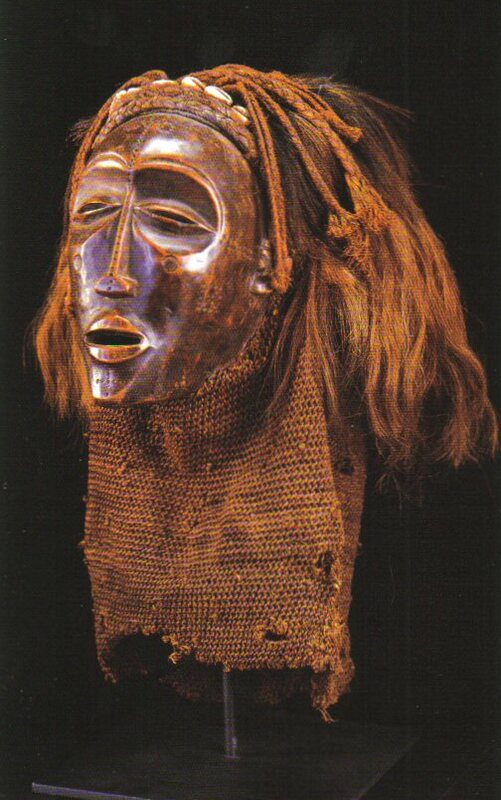 or Luchazi mask (retaining part of its original body covering) as an old woman, called Kashinakaji. of representation give shape to defined (shared or distinct) values or norms. Pwo/Pwevo mask. Luvale, early 20th century. Wood, pigment; 21.6cm (8.5"). 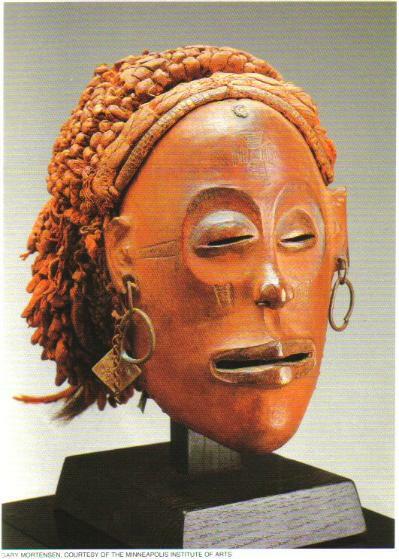 a female chief or a woman in a royal lineage.